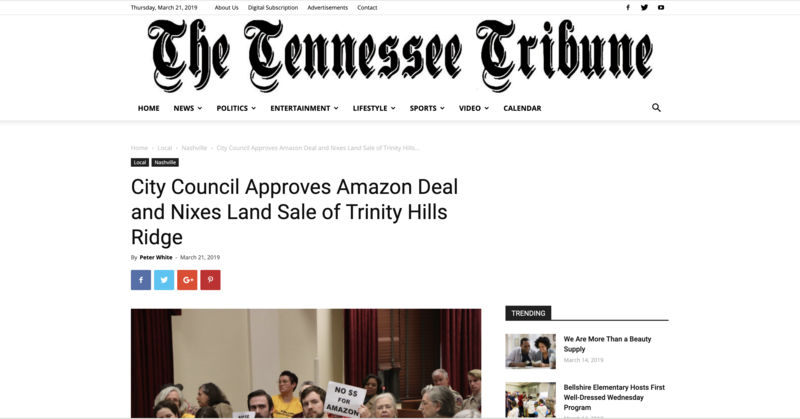 NASHVILLE, TN – The City Council voted Tuesday to pay Amazon up to $17.5m to create 5,000 jobs at the Nashville Yards in the next seven years. That’s $500/job. The incentive package is not one big deal but seven smaller ones with a $2.5m cap each year. If Amazon creates more than 5000 jobs, the city council would have to approve any additional job incentive payments. Also, the arrangement allows Metro to skip a year. In other words, the seven years don’t necessarily have be in a row. An amendment by At-Large Councilman John Cooper draws Amazon payments from the Music City Convention Center (CCA) instead of the general budget. The council will ask CCA to release up to $2.5m before the next year’s budget is adopted.